1. Always charge the battery fully (until the battery full notification is seen or the battery status bar stops running and stays in full position and charging indicator light is off). 2. Activate power saving mode. Press the power key, and select Activate power saving. 3. Change the synchronisation frequency for your mailbox. Select Menu > Applications > Mail, your mailbox, and Options > Settings, and the relevant sync frequency settings. 4. Mute unnecessary tones, such as key tones. 5. Use wired headphones, rather than the loudspeaker. 6. Deactivate the background animation effects. Select Menu > Settings >Themes > General > Options > Theme effects > Off. 7. Deactivate the Big clock screen saver. Select Menu > Settings > Themes > Screen saver > None. 8. Features that use Bluetooth technology, or allowing such features to run in the background while using other features, increase the demand on battery power. To prolong the operating time of your device, turn the Bluetooth technology off when you do not need it (Menu > Settings > Connectivity > Bluetooth > Bluetooth = Off). 9. Features that use wireless LAN (WLAN) increase the demand on battery power. WLAN on your Nokia device switches off when you are not trying to connect, not connected to another access point, or not scanning for available networks. To further reduce battery consumption, you can specify that your device does not scan, or scans less often, for available networks in the background. WLAN switches off in between background scans. When Menu > Settings > Connectivity > WLAN > Options > Settings > Show WLAN availability is set to Never, the WLAN availability icon is not shown in the standby mode. However, you can still manually scan for available WLAN networks and connect to WLAN networks as usual. 10. If you have set Packet data connection to When available in connection settings, and there is no packet data coverage (GPRS), the device periodically tries to establish a packet data connection, which causes increased demand on battery power. To prolong the operating time of your device, select Menu > Settings > Connectivity > Admin.settings > Packet Data > Packet data connection > When needed. 11. The Ovi Maps application downloads new map information when you scroll to new areas on the map, which increases the demand on battery power. You can avoid the automatic downloading of map data by downloading the needed map data via PC to your device. 12. If the signal strength of the cellular network varies much in your area, your device must scan for the available network repeatedly. This increases the demand on battery power. If the network mode is set to dual mode in the network settings, the device searches for the UMTS network. If it is not available, the device uses the available GSM network. To only use the GSM network, select Menu > Settings > Connectivity > Network > Network mode > GSM. 13. The backlight of the display increases the demand on battery power. 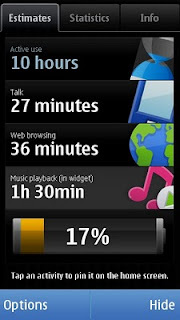 To change the timeout after which the backlight is switched off, select Menu > Settings > Phone > Display > Light time-out. To adjust the light sensor that observes the lighting conditions and adjusts the brightness of the display, in the display settings, select Light sensor. 14. The notification lights can be turned off to save the battery. Select Menu > Settings > Phone > Notification lights and disable the breathing light in Breathing light and adjust the light settings for different events in Notification light menu. 15. Leaving applications running in the background increases the demand on battery power. To close the applications you do not use, press and hold the menu key, swipe to the application in the list and close it by selecting X. 16. Pay special attention that you don't leave applications running in the background which are using GPS or network connection, for example Maps, if you are not using these applications. 17. Home screen widgets may periodically connect to internet if the home screen is in online mode. If you are not actively using the widgets, the automatic connection can be disabled by selecting Options > Widgets to offline mode on the home screen. 18. Installed 3rd party applications may consume extra power. Uninstall the application if you have noticed that power consumption has increased after the application was installed and if the application is not needed any more. 19. The AMOLED display in your device consumes more power with white color. Therefore the themes with a lot of white colors (e.g. in wallpaper image) may consume more power than the other themes. 20. When connecting to the internet, use a WLAN connection, rather than a packet data (GPRS or 3G) connection. 21. When you are listening to music, and do not want to make or receive calls, activate the offline profile..